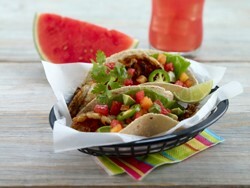 RECIPE: ROCK LOBSTER AND WATERMELON TACOS - What About Watermelon? Who says lobster tacos are only for summer? With this delicious new spin on the fish taco craze, these Jamaican Rock Lobster Tacos are a must-have all year round. Perhaps your New Year’s Resolution is to cook with more watermelon or establish healthier eating habits. If so, you’re in luck with this recipe. Lobster, among other shellfish, is reported to be a healthy way to consume protein and other important nutrients. Rich in omega-3 fatty acids, this helps to lower the risk of heart disease. It’s also low in calories and fat and contains high levels of Vitamins A and B. Not that you needed yet another reason to dig into these tacos. You know, other than that fact that they contain lobster and watermelon. Cut tails in half lengthwise, remove vein, cut into ½-inch slices. Combine lobster with watermelon, avocado, papaya and cilantro. Pour lime juice into small bowl and slowly whisk in. Pour over lobster mixture and refrigerate one hour, stirring occasionally. Place in soft taco shells on a bed of shredded lettuce. Sprinkle with coconut. These are incredibly delicious. I have made them on multiple occasions!